Michel de Nostradame, (latinised to: Nostradamus) was a French ‘seer’ who died in 1566 and wrote over a thousand predictions about the coming centuries, contained in Les Propheties. He wrote these as four line poems, organised into ‘quatrains’. Les Propheties was published as 10 volumes, each referred to as a ‘century’. The seer has been credited by some with predicting World War Two and the 11 September Attacks on New York City. Some believe that Century III, quatrain 81 refers to the 2016 presidential election. Le pont rompu, cité de pur pasmee. OK. That sounds about right. Especially given that in addition to being President, Mr Trump is also the Commander-in-Chief. 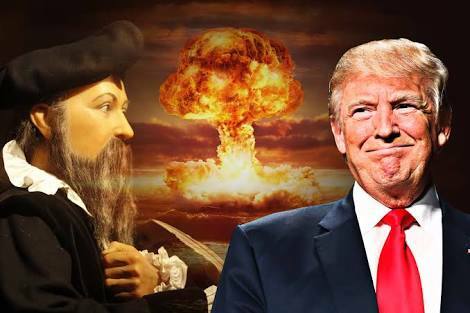 Other predictions from Nostradamus have also been related to the 2016 US presidential election. Not to be rude, but some have suggested the ‘masculine woman’ is Hillary, and the stronger Eastern Europe is Russia? Perhaps a reference to the alignment between Trump and Vladimir Putin’s foreign policy? Or maybe the ongoing investigation into allegations of Russia collusion? Perhaps Mr Trump’s second year as President will reveal more truths.